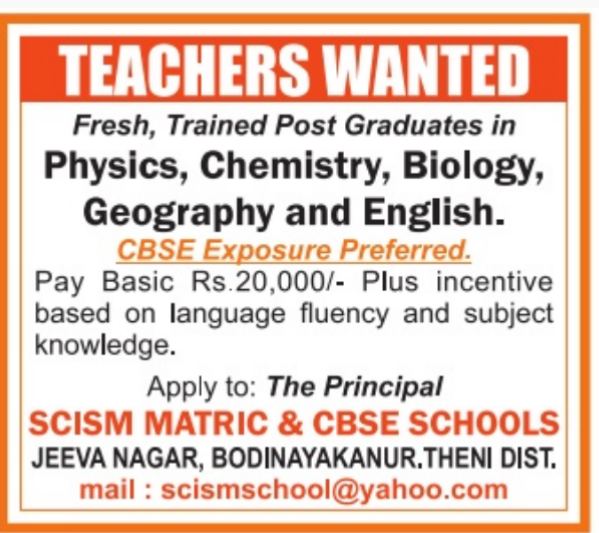 SCISM Matric & CBSE Schools, Theni has advertised in the HINDU newspaper for recruitment of Teaching Faculty-Fresh and trained, PGT jobs vacancies. Interested and eligible job aspirants are requested to apply immediately.Check out further more details below. 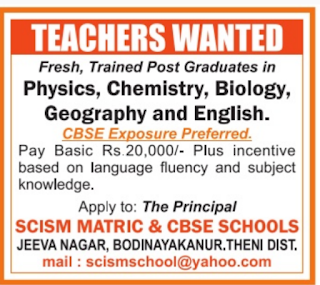 Name of the School :SCISM Matric & CBSE Schools, Theni. About School:Our Founder (Late) Rev.Jeyaraj Vedhamanickam, a God fearing man hailing from Kanyakumari district came to Bodi as a clergyman with a commitment to serve the society. Later in 1973 he inspired his wife, a government teacher, to resign her job and started SCISM English School. The Couple gave themselves wholly and their blessings have led the management, the teachers and the students to reach greater heights for the past 40 years. Pay basic 20,000/- plus incentive based on language fluency and subject knowledge. Reference: Recruitment Notification / Career Job Opportunities notice for Teaching Faculty -Fresh and Trained, PGT Jobs on Hindu newspaper Dated 1st July 2018.